As to abuse within architecture, I'd point the guilty finger at position of power and enablers well before I'd point to creative genius as lone wolf. The abuser as well as the enablers are seduced by the position of power, and not seduced by creative genius. And the abuser doesn't use creative genius to manifest abuse, rather the abuser uses the position of power to manifest abuse. "To fight sexual abuse and abusers, we must first let go of this simplistic and fictitious image of the lone wolf." How about fighting sexual abuse and abusers by "blowing the whistle" and publishing the matter via MeToo. The notion of letting go the "simplistic and fictitious image of the lone wolf" as a first step in fighting sexual abuse and abusers has here already been demonstrated to be ineffective. Pretty much all the above notions of the lone wolf remain simplistic and fictitious, and continually throwing this fictitious lone wolf "under the bus" really isn't doing anything to fight sexual abuse and abusers. Again, make it real--blow the whistle and publish via MeToo. What exactly is it that you see people here agreeing with you? I see a lot of disparagement of the fictitious lone wolf myth, but nothing about how letting go of the lone wolf myth would fight abuse and abusers. How exactly would letting go the "simplistic and fictitious image of the lone wolf" fight sexual abuse and abusers? On Tuesday I unexpected found myself thinking about the letter Robert Venturi sent me where he lamented the loss of the big BASCO sign in Northeast Philadelphia and thanked me for telling his firm about the sign's removal. Yesterday, because of work on drawings of Frank Lloyd Wright's Price Tower, I spent some time looking at all the various documentations of Horace Trumbauer's architecture within the collections of the Library of Congress. And towards the end of the day, when I visited Dezeen, I learned of the death of Robert Venturi. For a couple of decades, the work of Trumbauer and Venturi coincided most closely at the Philadelphia Museum of Art. Sadly, I believe a fair portion of Venturi's work at the PMA is now also removed. A month ago, it was being found out that Venturi's Eclectic Houses are far more complicated than they at first appear. 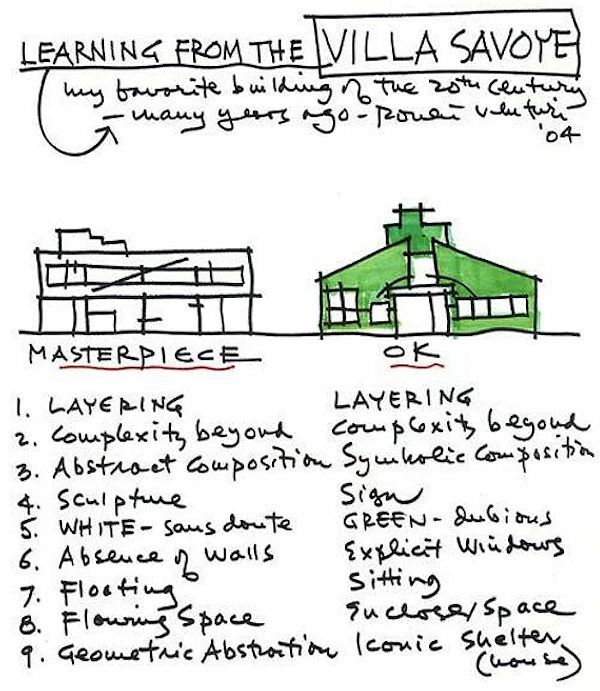 There is still so much more to learn from Robert Venturi. 2. Renovations of the James B. Duke House, The Institute of Fine Arts, New York University, Robert Venturi, Cope and Lippincott, Associated Architects, 1959. The mansion on upper Fifth Avenue was donated to the Insitute of Fine Arts for use as a graduate school of the History of Art. It was dsigned by Horace Trumbauer in 1912; its interiors are by Alavoine. It is a copy of the Hôtel Labottière in Bordeaux on the outside, but it is blown up and expanded in size--a Louis VIV scale in a Louis XVI building. Its Edwardian-Louis XVI details are exceptionally fine inside and out. It appears that Renovations to the James B. Duke House was Robert Venturi's first build project. I wonder how much of Venturi's renovations are still there. William Short resigns as Venturi's partner and is replaced by John Rauch. The firm becomes known as Venturi and Rauch. In April, after five years of planning and nearly eight months of construction, Venturi and his mother move into the house he designed for her. The Fairmount Park Fountain Competition is by Venturi and Rauch, with Denise Scott Brown. Scott Brown is associate professor at UCLA. Scott Brown and Venturi marry in Santa Monica, California. Scott Brown resigns her position at UCLA. 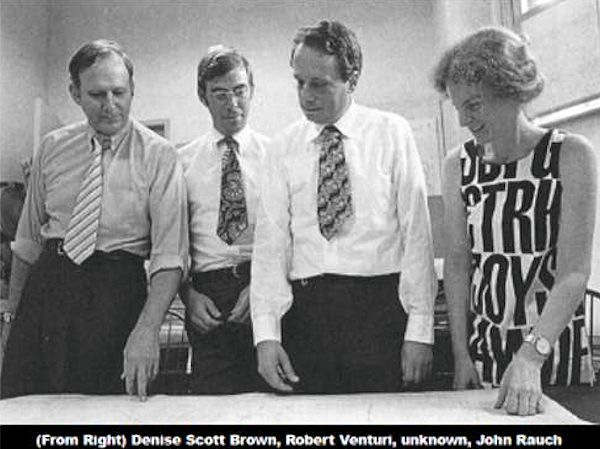 Scott Brown is associated with several Venturi and Rauch projects (as listed in Learning from Las Vegas, first edition); there also named as "partner in charge" of The Philadelphia Crosstown Community (project), 1968. Scott Brown become a partner in the [Venturi and Rauch] firm. The "unknown" in the above photograph is (probably) Gerod Clark, "partner in charge" of Fire Station No. 4, Columbus, Indiana, 1965. Scott Brown is wearing her wedding dress in this photograph; assumed date circa 1969.